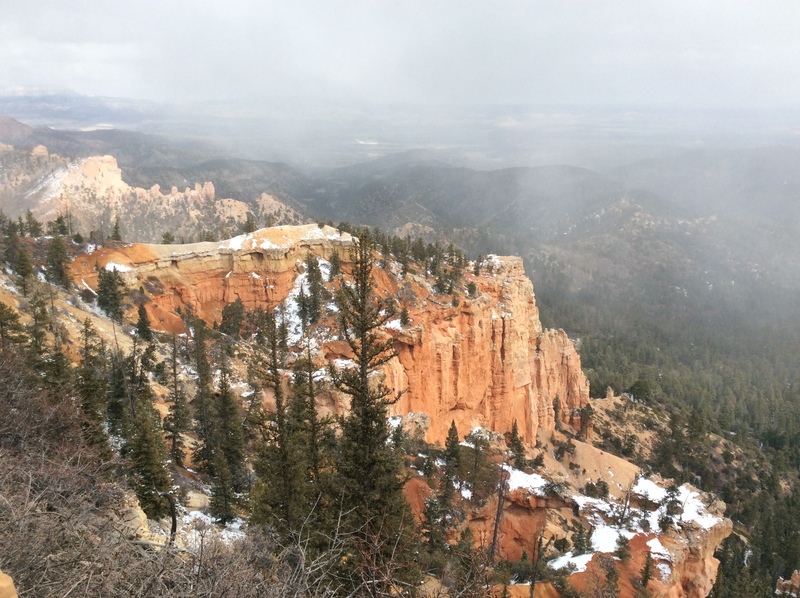 Today is a good day for a road trip after yesterday’s strenuous hike to Angels Landing. 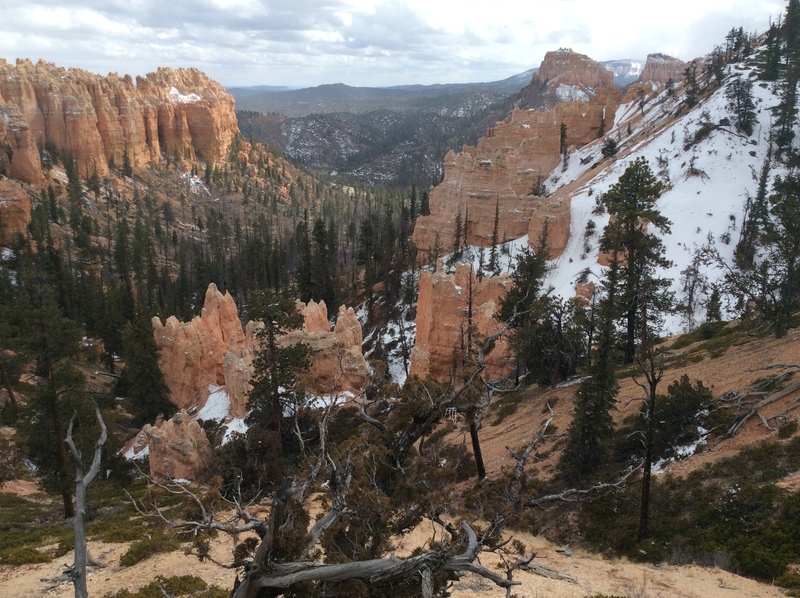 So we drive 80 miles to Bryce Canyon. 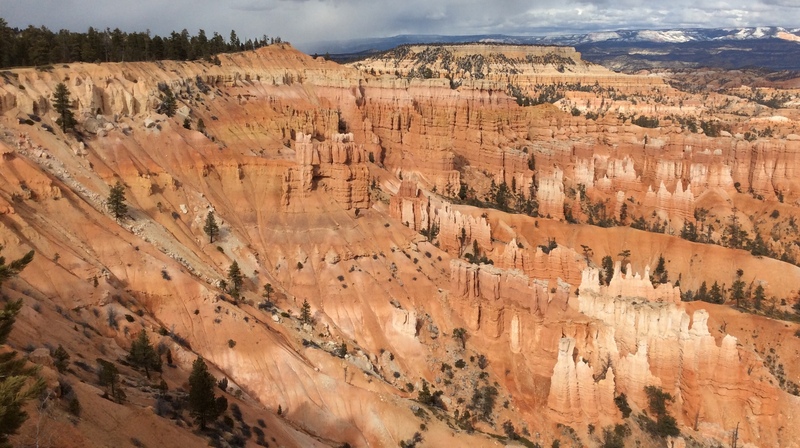 Our original plans were to leave Zion tomorrow, Sunday, and spend 3 nights in Bryce. 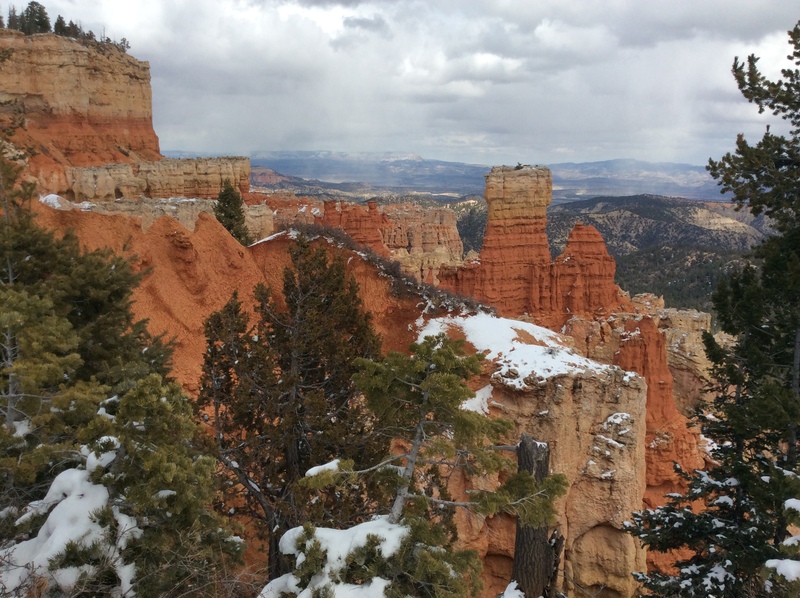 After checking the weather, however, we opt for 3 more nights at Zion. 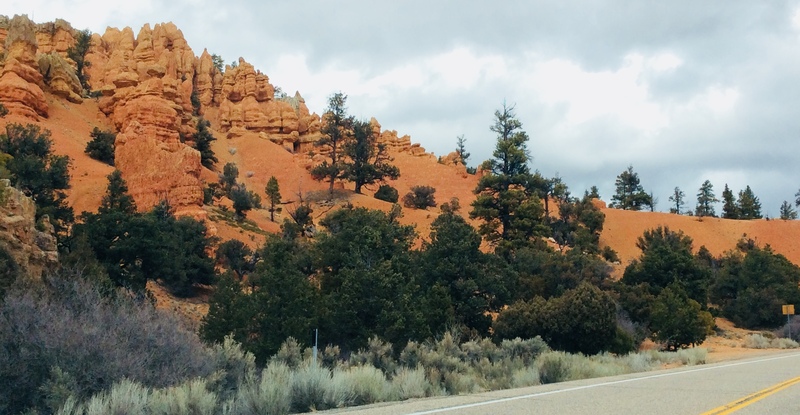 It’s a scenic but overcast drive as we head north on US Route 89. 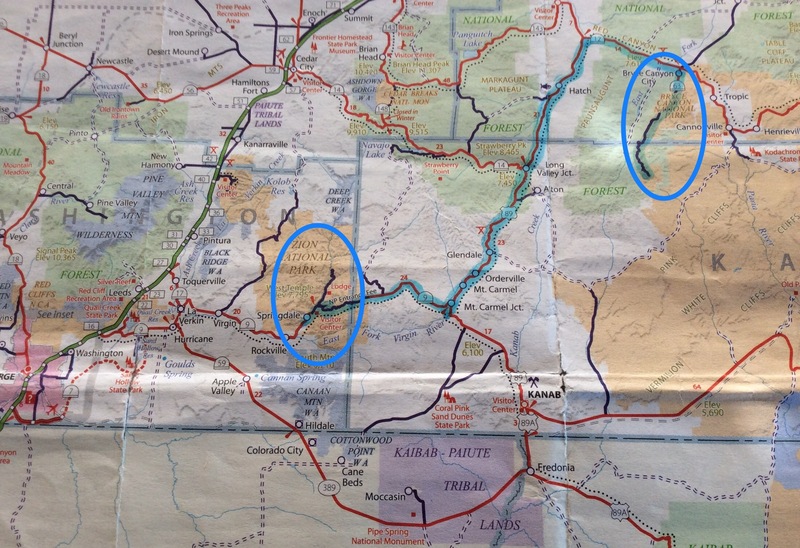 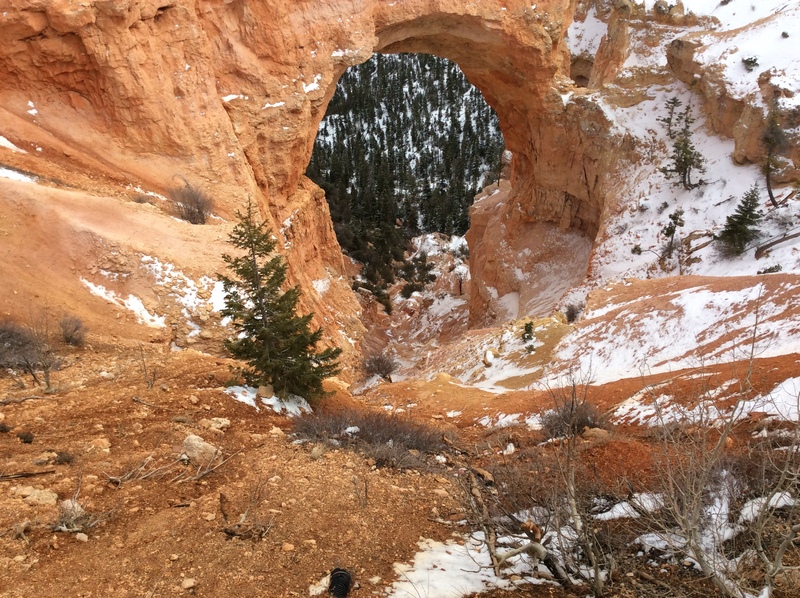 We turn east on Utah State Route 12 and pass through Dixie National Forest. 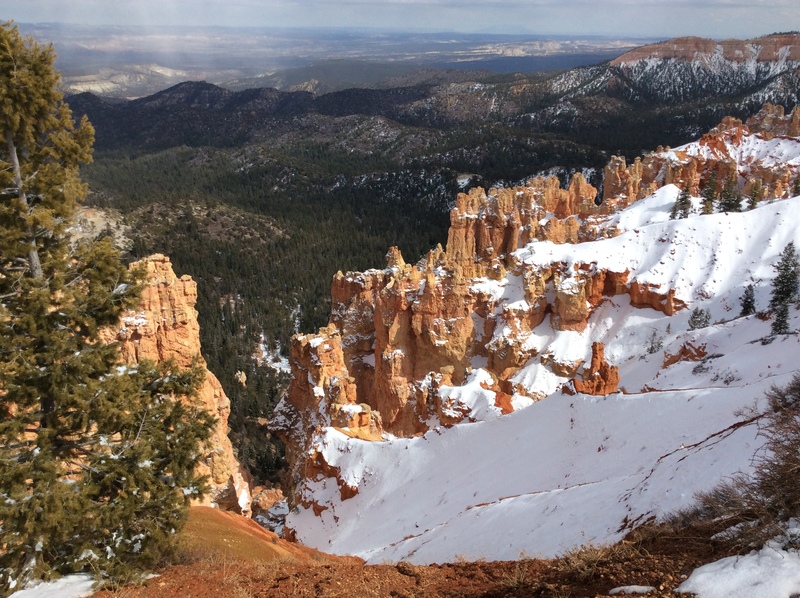 The sun pops out now and then and I get some pretty previews of the red sandstone and hoodoo formations yet to come. 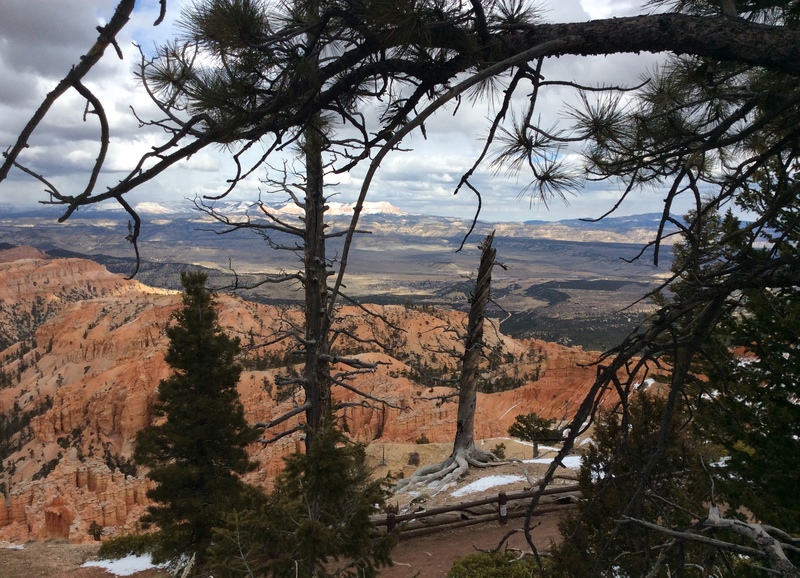 Utah State Route 63 heads south and takes us into the National Park. 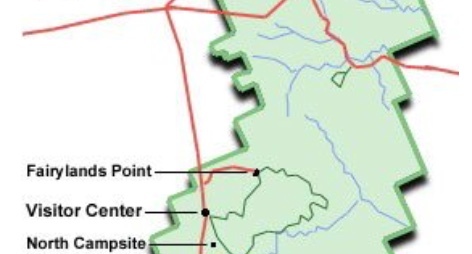 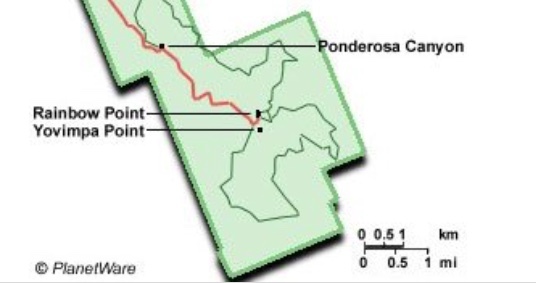 Actually, 63 dead ends into the Park and is the main road through the Park. 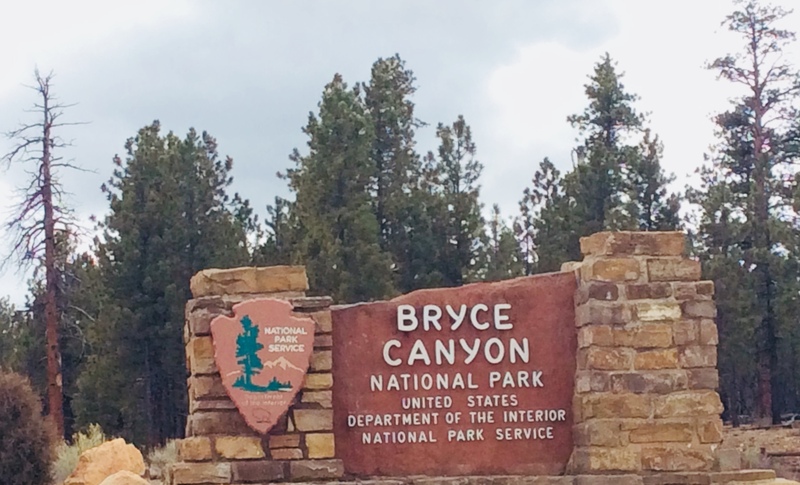 As we drive to the Park’s entrance, we notice that most of the restaurants, attractions, and souvenir stores leading to Bryce Canyon are not yet open. 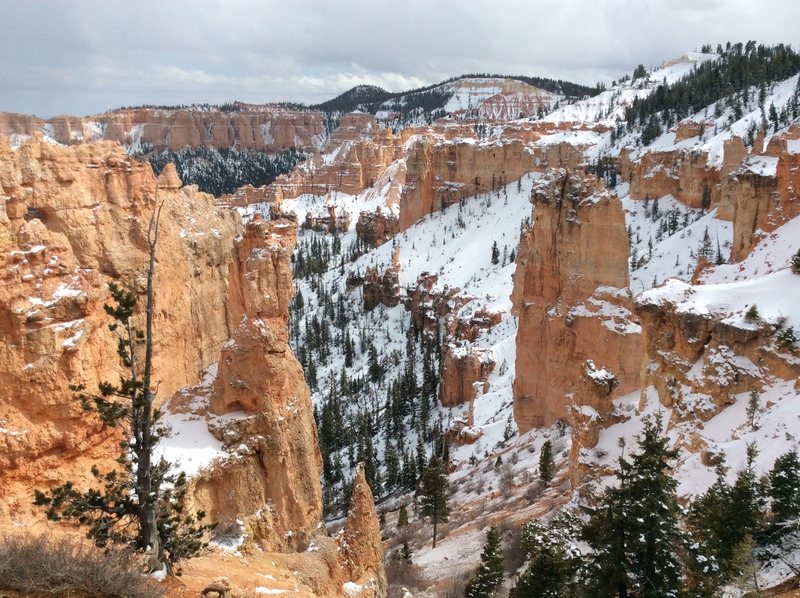 It’s still snowy and cold at this higher elevation, validating our decision to stay longer at Zion NP. 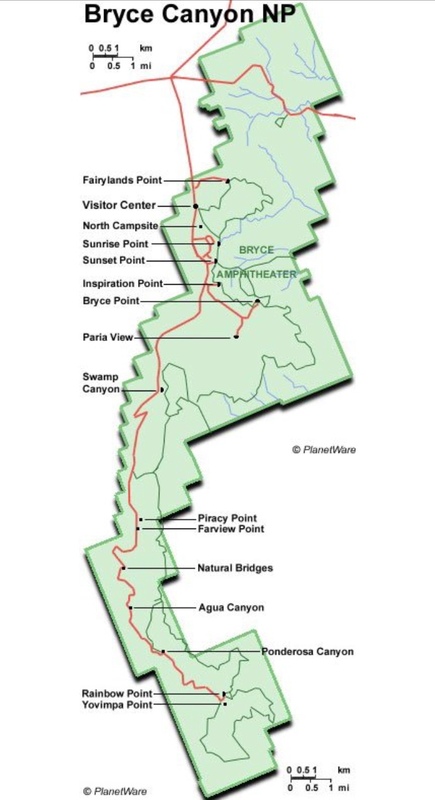 Since the shuttle is not running yet, we drive to Rainbow Point and make our way back through each stop along the way. 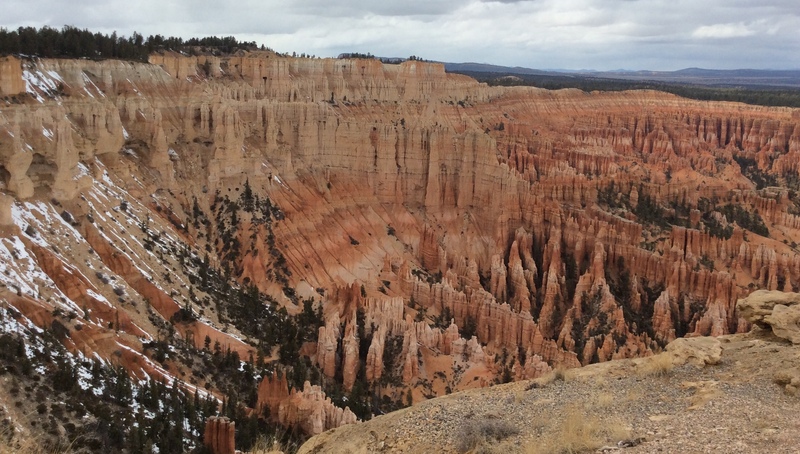 The drive through Bryce Canyon is not what I expected, coming from Zion NP. 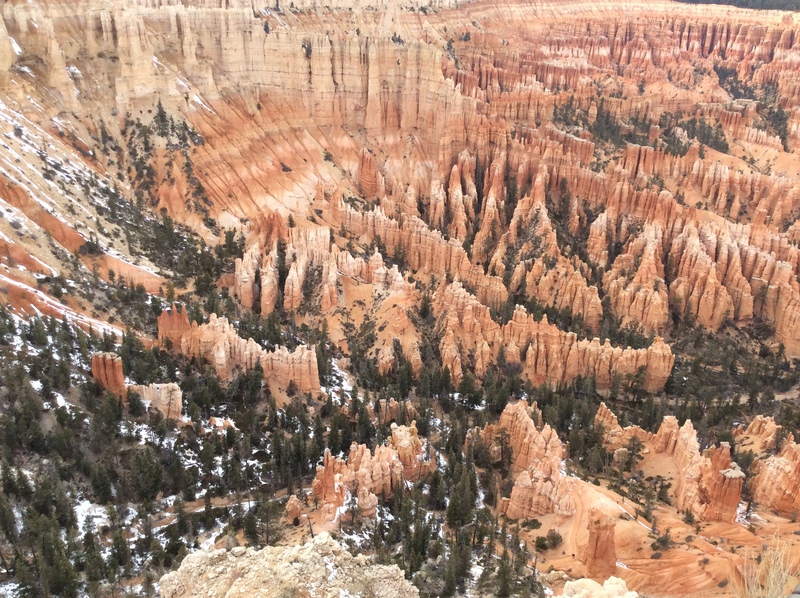 The Park traverses the rim of the canyon instead of cutting through it. 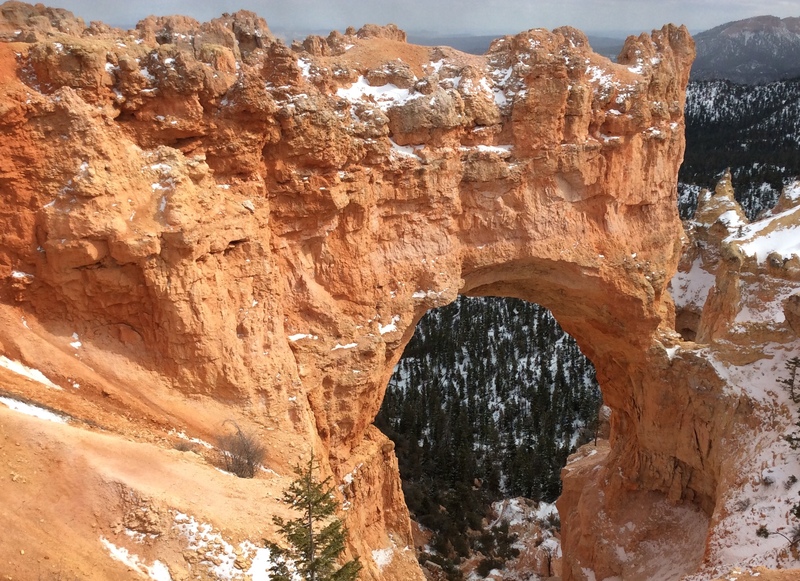 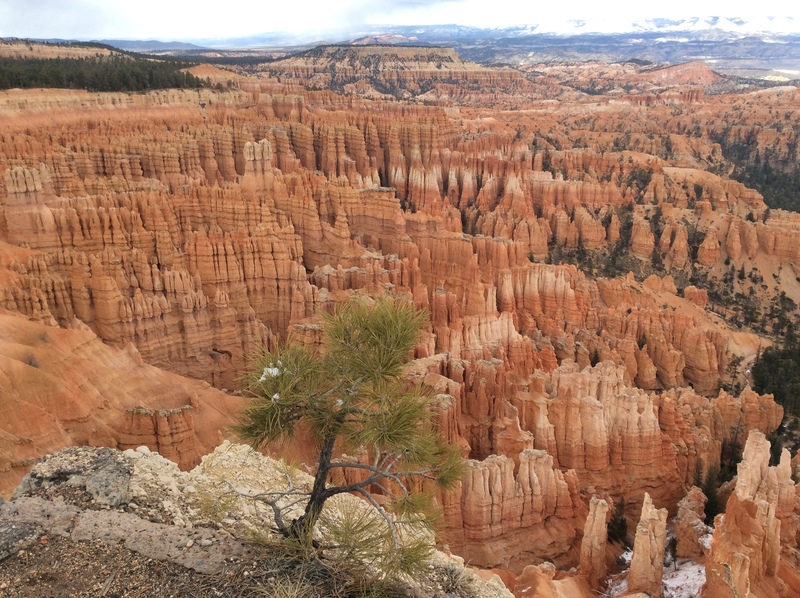 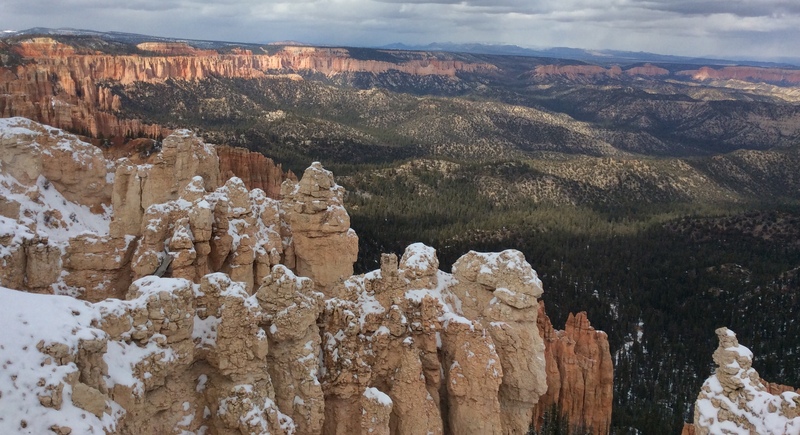 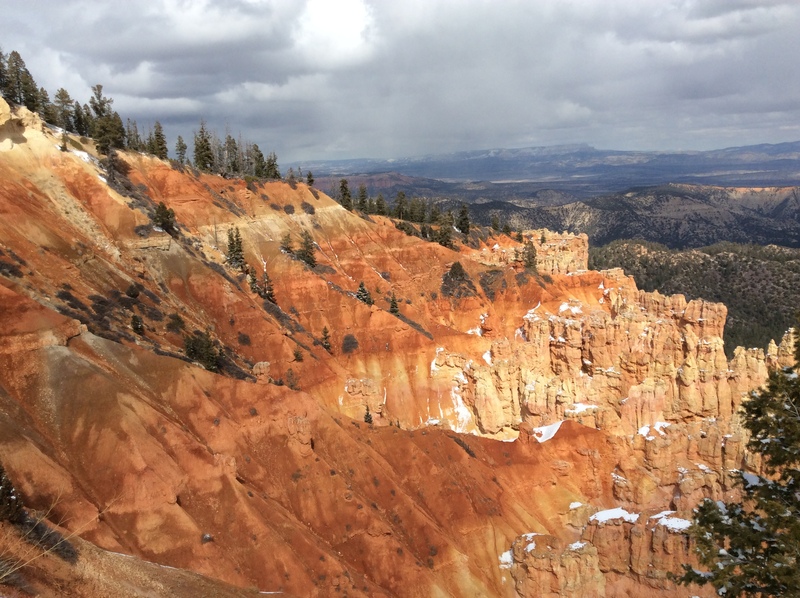 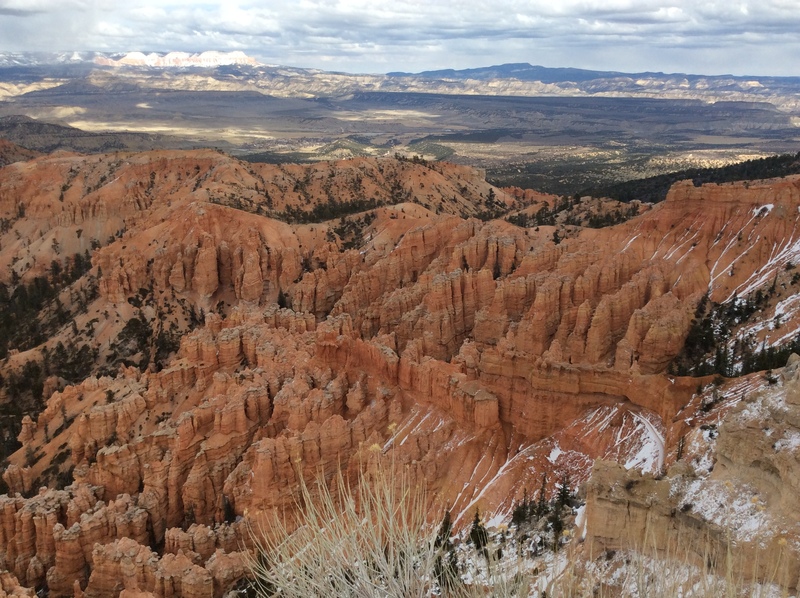 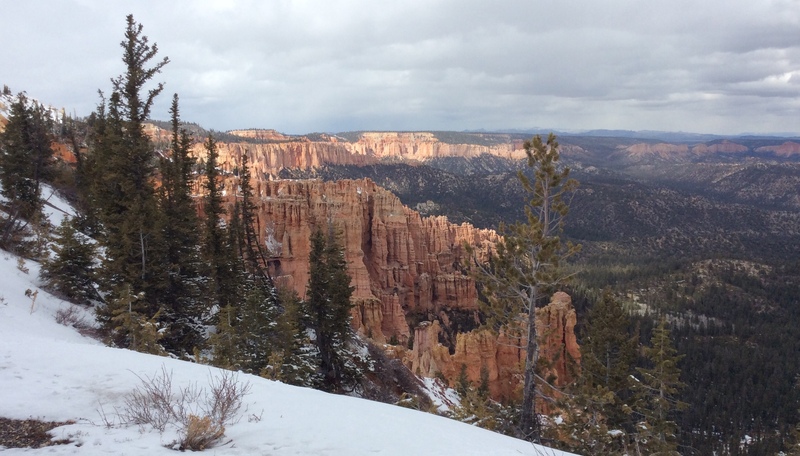 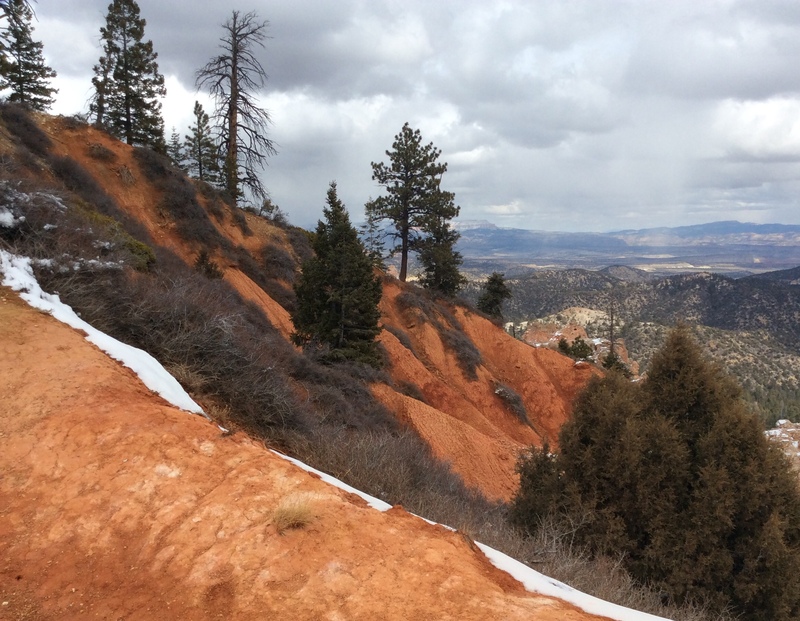 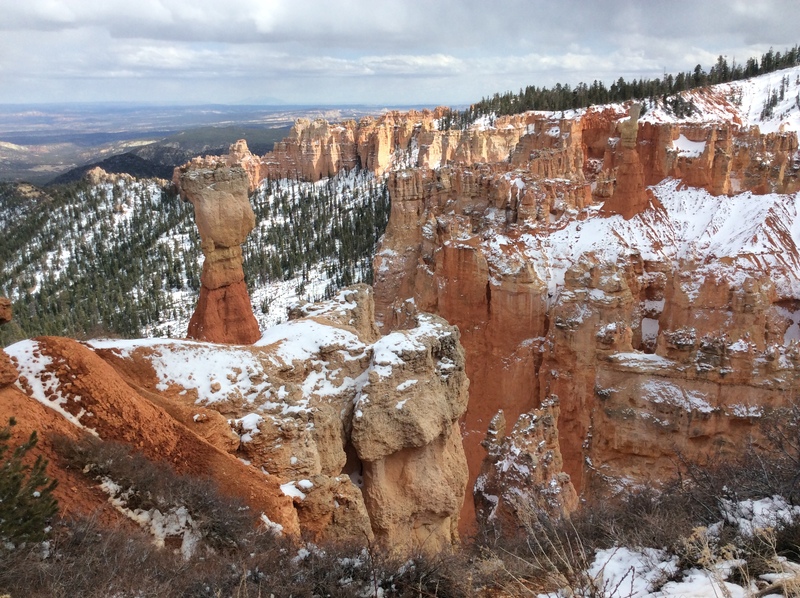 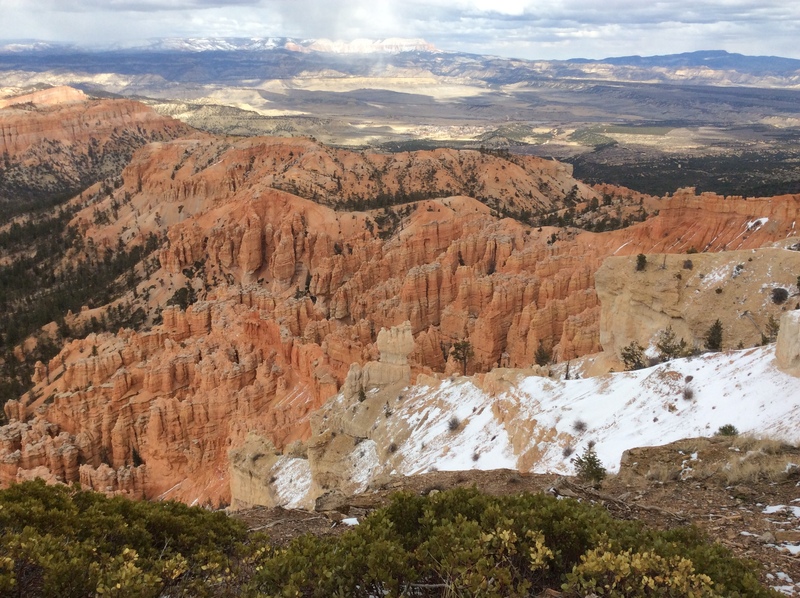 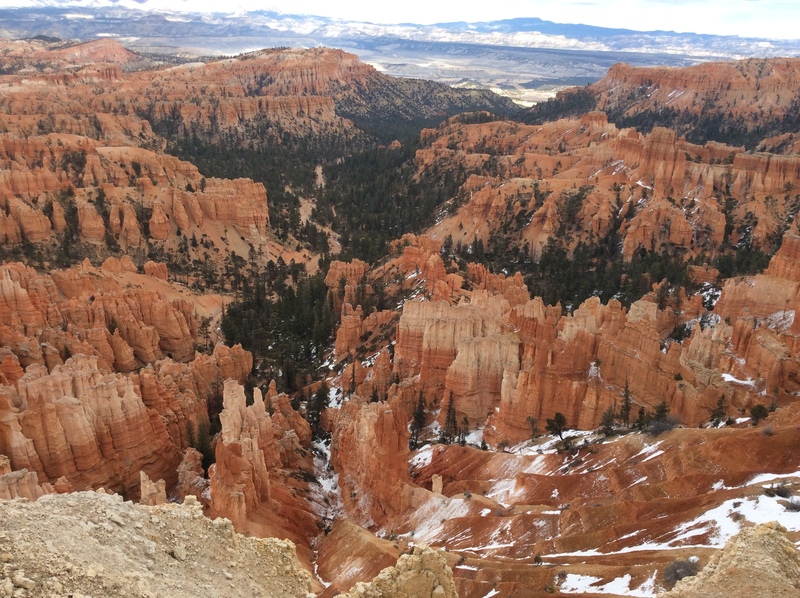 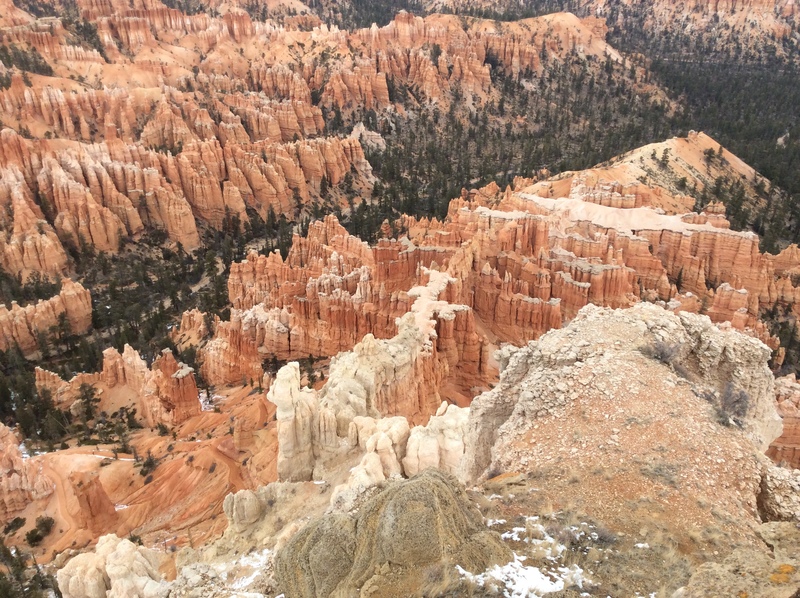 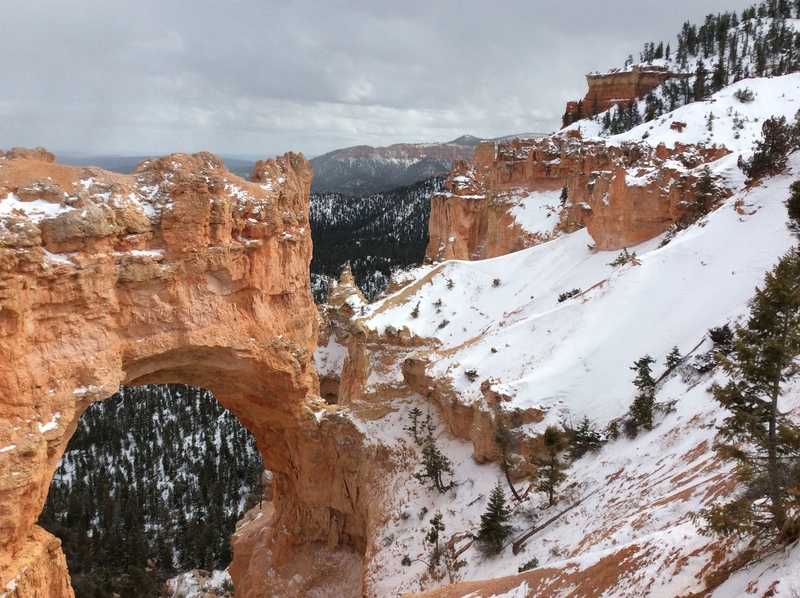 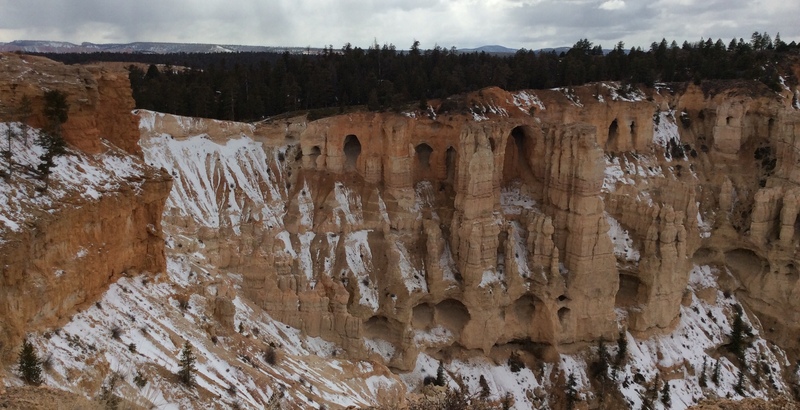 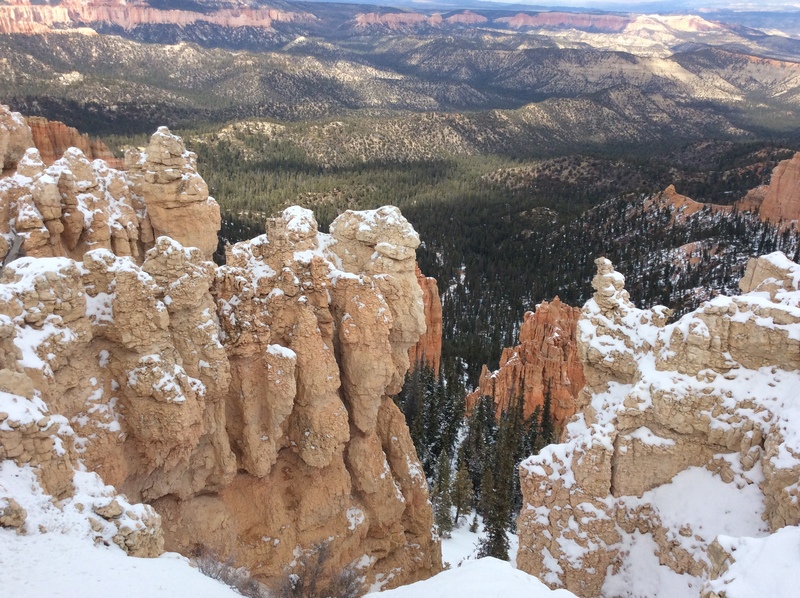 To partake the marvelous views you need to view Bryce from the edge or hike through it. 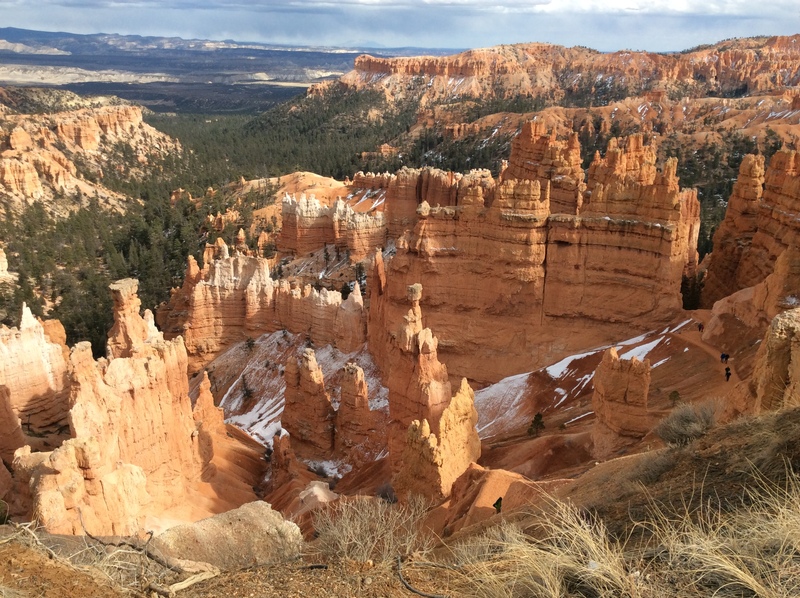 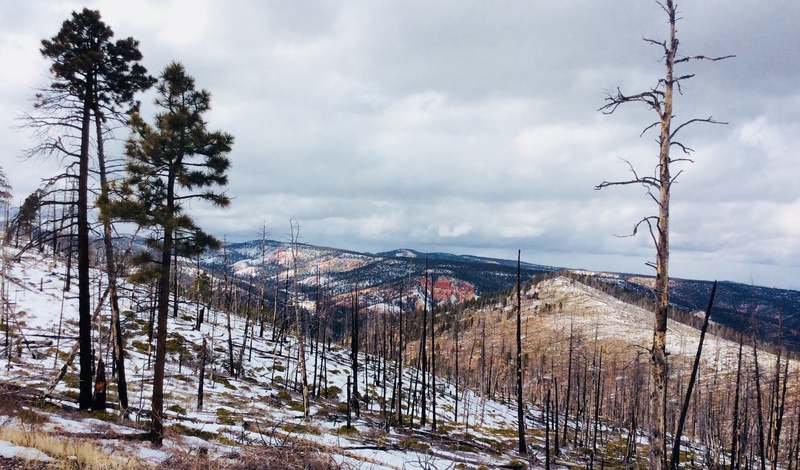 So as we drive the 18 miles to the end of Route 63, relax while I give you a brief history of Bryce Canyon’s geological wonders. 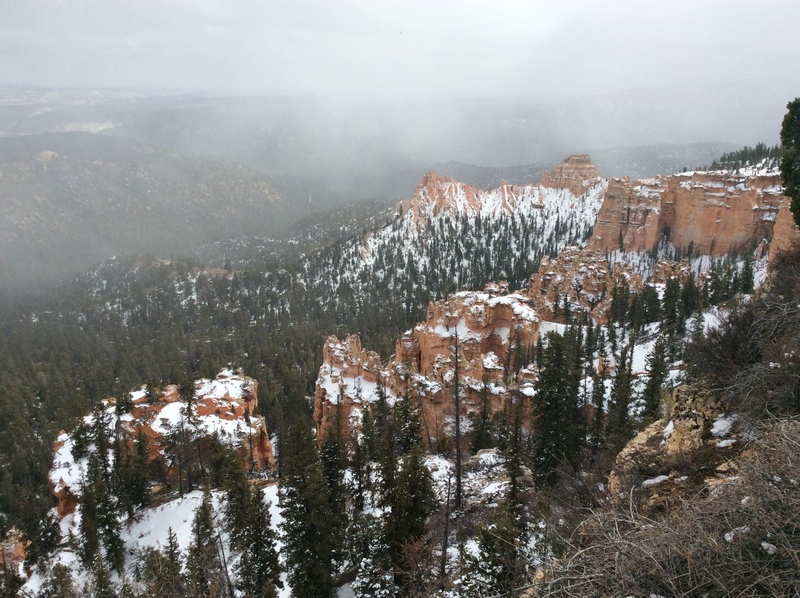 As we drive back to Zion, the weather threatens snow and the temperatures drop. 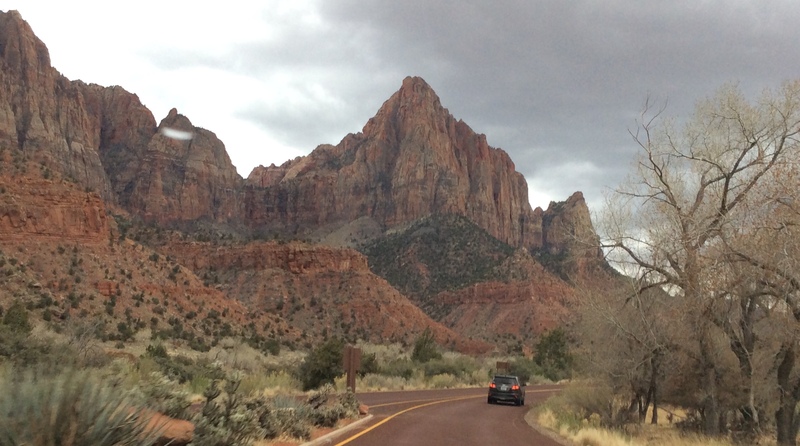 But Watchman Mountain stands tall and offers protection and comfort as we exit Zion NP and cozy-up in our RV.